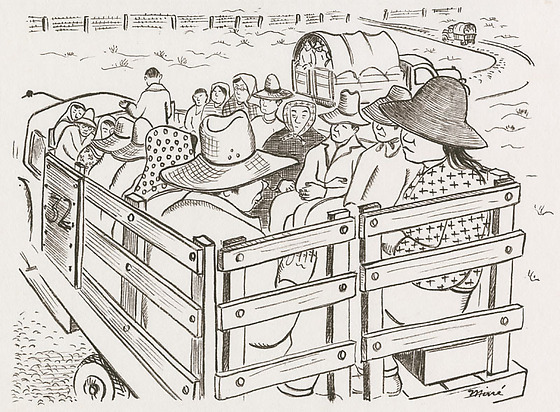 A woman in a cross-patterned shirt and straw hat, Mine Okubo, sits in the back of an uncovered truck with fifteen other residents on their way to help harvest vegetables. Most wear hats or head scarves. A wooden sign with the number 32 is nailed to the side of the truck. Two covered trucks with more residents are visible on the curving road ahead of them. A barbed wire fence lies on the horizon. Signed at bottom right corner: Mine. Written in pencil, bottom right corner: 188. Written and circled in pencil, bottom left corner: 188. Stamped in black ink on back, top left corner: 5191. Written in pencil on back, bottom right corner: 188. Drawings for the book, Citizen 13660, began as sketches and drawings created by Okubo while incarcerated at Tanforan and Topaz to tell faithful friends about camp life and were intended for exhibition purposes. Drawing is on page 197 of book.